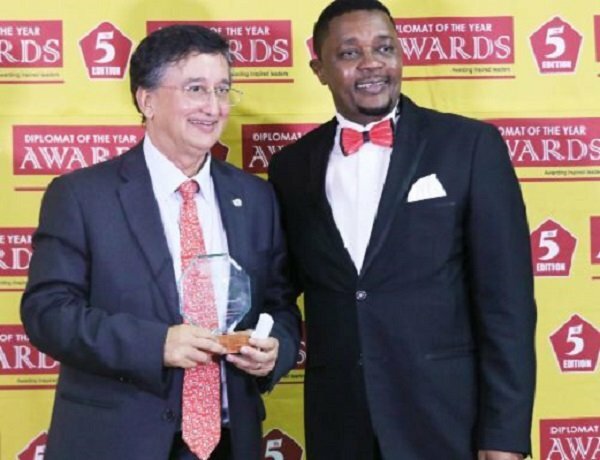 ZIMBABWE – United Nations resident coordinator Bishow Parajuli bagged the 2016 diplomat-of-the-year award at a colourful ceremony held on Friday night. Prajuli won the award at the fifth edition of the Diplomat of the Year Awards, which were this year hosted under the theme, Tourism: driver of economic development and diplomacy. Tourism and Hospitality minister, Walter Mzembi, who delivered the keynote address, urged diplomats to act fairly and justify their decisions when issuing travel warnings to their countries. Mzembi said while it was the duty of diplomats to issue warnings to their countries, it was wrong to exaggerate the security threats because it would unfairly affect tourism. “Travel advisories in most cases are conceived at a diplomatic level and here lies my plea to you, your excellences, to assist me in the achievement and consummation of the $5 billion tourism economy. To exercise fairness when you are issuing these travel advisories,” he said. Mzembi said last year Zimbabwe cancelled over 30 conferences which were supposed to be hosted in Victoria Falls over the Ebola outbreak in East Africa because some people in Europe and other parts of the world thought Africa was one country. He said diplomatic missions could play a pivotal role in helping their nationals understand these dynamics, which was the essence of the diplomatic awards, to honour such efforts. In other awards, Parajuli was also named outstanding head of mission from Asia, Australia and Americas together with Ambassador of Brazil Marcia Maro Dasilva, Ambassador of Korea, Kwon Yong Kyu and Australian Ambassador Suzanne McCourt. Outstanding deputy ambassadors or first secretaries were also recognised for their work, with Fahad Alshatti of Kuwait, H M Lugor of South Sudan and Isaac Mwakiluma of Tanzania being named winners. Eye specialist Solomon Guramatunhu won the outstanding contribution to diplomacy and citizen diplomacy by a non-diplomat. Phillipe Van Damme, the head of EU delegation, Ambassador of Italy, Enrico De Agostini and Ambassador of Britain Catriona Laing were winners in outstanding heads of missions from Europe. In Africa, Ambassador of Angola, Pedro Hendrik Vaalneto, Botswana’s Kenny Kiniotrio Kapinga and Namibian Ambassador Balbina Daes Piennaar were also honoured.